Mangaluru, Sep 4,2017: Communal harmony in the State and preventing the Opposition Bharatiya Janata Party’s ‘Mangaluru Chalo’ motorcycle rally — starting September 5 in five cities — from escalating into a law and order war, is the first major challenge before Karnataka’s new Home Minister, Ramalinga Reddy. the State heads towards Assembly elections next year, maintaining peace in the district is of prime importance for the Congress. Speaking to media, Home Minister Reddy admitted that maintaining law and order in DK and other parts of the State was his top priority. Asked about the government’s plan to stop the Bharatiya Janata Party’s march, the Home Minister said, “The Home Department will not object to any political party taking out rallies. But, rallies should be held in a correct peaceful manner, with prior permission from the department. No one will be allowed to be a law unto oneself.” A meeting of top police officers would be convened in a day or two and all officers would be instructed to keep a strict vigil on trouble makers in Dakshina Kannada and other districts. “In a few days, I too will visit the district to assess the ground situation,” Reddy said. Sources said that Mr. Siddaramaiah told Mr. Reddy to take necessary steps to ensure peace in the communally-sensitive district of Dakshina Kannada, which has witnessed communal incidents in the last few months. The BJP has decided to organise the ‘Mangaluru Chalo’ from Sept 5,Tuesday, from different cities in the State to force the State government to ban the Karnataka Forum for Dignity (KFD) and the People’s Front of India (PFI). BJP State president B.S. Yeddyurappa and other leaders will attend a public meeting to mark the culmination of the rally on September 7 in Mangaluru. The BJP’s main argument is that despite the alleged “involvement of KFD and PFI activists in a number of murders”, including that of Rashtriya Swayamsevak Sangh activist Sharath Madiwala, the State government has not taken action to ban the organisations. A day after allocation of the Home portfolio, Minister Reddy, who called on Chief Minister Siddaramaiah at the latter’s official residence, Krishna, briefly held discussions on issues related to the Home Department. 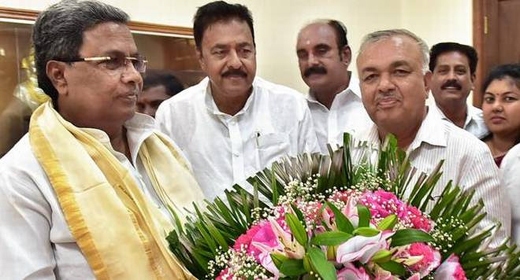 KPCC president G. Parameshwara, party insiders said, is continuing to sulk for not being consulted by the Chief Minister on the Cabinet reshuffle.